The Wolfpack will be howling at this year’s New Orleans Jazz & Heritage Festival. The Loyola University New Orleans Jazz Ensemble and the Thelonious Monk Institute of Jazz Performance Septet are among the festival’s impressive musical lineup. Both groups will be featured guests at the WWOZ Jazz Tent with the ensemble playing on Sunday, April 26, at 11:15 a.m., and the septet performing on Sunday, May 3, at 11:20 a.m. The Loyola Jazz Ensemble, directed by professor of music John Mahoney, will play a variety of jazz standards and originals, among them a piece by Loyola alumnus Jon Cowherd, “Crooked Creek,” arranged by Mahoney, and “Industrial Strength Stomp,” by the late composer and arranger Bob Florence. Several graduating seniors from the College of Music and Fine Arts will be performing in the ensemble. They include Woody Rinker on alto saxophone, Chris Guccione on drums, Josh Gouzy on bass, Alex Bachari on guitar, Jesse Reeks on piano, James Westfall on vibraphone and Peter Honan on trumpet. The Monk Institute’s concert will serve as one of the septet’s final performances together. The majority of the members will be among the Monk Institute’s first graduating class since it relocated to Loyola’s campus from Los Angeles in 2007. The Monk students will walk in Loyola’s 2009 graduation ceremony. Loyola University’s commencement will be held Saturday, May 9, at 10 a.m. at the Louisiana Superdome. Herbie Hancock, chairman of the Thelonious Monk Institute of Jazz Performance, will receive an honorary doctorate degree from Loyola. He and Thelonious Monk Jr., son of the institute’s namesake, will both be present at the ceremony. The New Orleans Jazz & Heritage Festival is a multi-day cultural celebration in which thousands of musicians, chefs and crafts artists welcome more than 400,000 visitors annually. The event showcases unforgettable music on several stages, delicious regional cuisine and crafts from the region and abroad. This year, the event will be held April 24, 25, 26, 30 and May 1, 2, 3, at the New Orleans Fair Grounds. For additional information or to purchase tickets, visit the New Orleans Jazz & Heritage Festival website at http://www.nojazzfest.com. 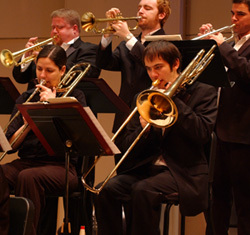 For more information about the Loyola Jazz Ensemble, contact Mahoney at mahoney@loyno.edu or 504-865-2164. For more information about the Thelonious Monk Institute of Jazz Performance Septet, contact Holly Wallace at hwallace@monkinstitute.org or 504-865-2100.